Aidan Baker & The Infant Cycle - "Rural Sprawl"
Summer - repetitive loops become overgrown with the juicy flesh of atonal sound and transform into sampled rhythms flown over by a soft guitar tune. Autumn - the rhythm is reduced to a hardly evident monotonous shroud, the atmosphere becomes more melodic and melancholic and in the end turns into a heart-piercing guitar solo. Winter - time for sleep and detachment: icy ringing, the slow breath of bass impulses, the rustling of electronics and sluggish drones painting vast snowy soundscapes. And finally spring - the drone ambient nature unfolds large as life, majestic sonic waves sweep accompanied by a swarm of tiny sounds awoken to life again. The first two tracks were recorded in 2001 (and released on CD-R by the Italian label Blade Records in 2002 in a very limited edition), two others were recorded in 2005 and thus completed the natural cycle of this album. [...] A new release contains two tracks previously released by Blade Records in 2002, and two new tracks, and all four recorded with Jim DeJong, also known as The Infant Cycle. Guitar, bass, tapes, rhythms, feedback generators, tapes, playouts, thumb piano, divided amongst the two who set out to put the four seasons to music. Its not easy to hear that in this music, which is throughout based in rhythmical cycles. Wether they find their home in repeating loops, or in slow percussive sounds, they form the strong fundament of the music. However Baker and DeJong know how to keep the material interesting, and not just have a bunch of loops running around all the time. On top of their loopings, they wave an ambient based pattern of sound on their guitars. A swirling piece of ambient music, which is exactly up the alley of both artists. Very nice, without big surprises. A new release by Aiden Baker is always a guilty pleasure. This one is a collaboration with The Infant Cycle, another experimental ambient project. Since a lot of releases by Aiden Baker are made up of quite subtle and deep and subtle (guitar)drones, I thought I put this on and listen to it with my headphones, lay in bed and travel to dreamland. Well… not quite. Not that it isn’t good, but the material is somewhat harsher and more disturbing in sound than I expected. It’s more of a surrealistic nightmare, made with sound. At least the first track is, and has been given the name ‘Summer’. Lots of rotating sounds are dizzying the listener. Looking at the album cover and name of the album, we might find ourselves in some rural area amidst grasshoppers and rural machineries. The second track, ‘Temperature Drop’, feels like the title, as it gets instantly colder. It’s a dark and creepy soundscape, though more subtle in its sounds than the former track. By the end of the song it’s becoming more intense with the use of layered guitardrones. ‘You Left Your Breath On My Window’ has a very sweet title and starts out as a weird soundscape. It eventually evolves into a magnificent drone where Aiden Baker is known for. The last song, ‘Rights Of Spring’, indeed feels like spring with the opening sounds of what seems like locusts or wind through the grass. It’s again a magnificent drone which lets you float above the rural landscape. Another great release for Aiden Baker and The Infant Cycle. This time it’s a trip through spring and summertime. Or perhaps a complete season cycle, since this release contains 4 very long tracks. Highly recommended! [...] Using the cover design as an initial focal point: a serene, almost haunting image of a battered wooden house staring down the encompassing landscape of cool breezy plains, I am transcended into this solitary patch of earth feeling both abandoned and embraced by the gentle rapture of electronic sounds. A contrast of despair and elation seem to coexist throughout these songs, with moments of beauty and tranquility revealing themselves amongst the constant brooding of dark ambient moods and placid drones. Each track washes through me, airy yet precise, allowing my mind to open into rarely explored dimensions of contemplation. "Summer" begins the journey with a cold mix of pulsing whirrs and sparse beat loops layering throughout an unforgiving soundscape while envelopes of metallic-sounding drones open and close with tender commands. Moving forward gracefully, "Temperature Drop" delivers a more spacious prose with lovely waves of tranquil ambiences which develop into an easel of haunting synth purges marked by a distant ticking beat. "You Left Your Breath On My Window" naturally sounds a bit more modern than the previous two pieces, beginning with a concert of glitchy tones bouncing off one another before transcending into lovely waves of rolling pads surging and receding underneath an ample plate of subtle ambient distortion. Lastly, the wavering electronic winds and delicate howls of "Rights Of Spring" bring this aural drift through the seasons to a close with an air of purposeful anticipation and receptive euphoria. Powerful and inspiring, "Rural Sprawl" is the kind of music you'll want to get lost in, not in the sense of being "lost" but rather allowing these stunning pieces to flow through your entire body, seeping into the unreachable corners of your mind, and enabling you to float away on whatever implausible daydream you care to have. [...] The record starts very convincingly with a pulsating and buzzing loop which is like a torrid midday sun over a dry field. However, this atmosphere is peeled off while the track is transforming into simplified quitar-drum jamming. The next track is bothered by the same transformation eventhough it starts with a nice merry 60's style cosmic echo and tinkle. Unfortunately, the start of the track "You Left Your Breath on My Window" reminend me only what electro achoustic music can be at its' worst: "uups, I dropped my mic" kind of noise. The closing track "Rights of Spring" contains more intense drone, but I wish the track would have ended without the nocturnal crickets. All in all, the album contains good incredients but I lost my interest during the ride especially in the quitar jams. Mari Björkman, Kuolleen Musiikin Yhdistys. The rite from the seasons is a universal constant that has impressed and affected humanity for millennia. This has had an effect over the human psyche, temper and spirit that has motivated artists through history to recreate their insights on the significance from these earthly transformations, often presenting these natural phenomena as metaphorical explanations on life and its passing or simply literally describing them as temporal changes with dissimilar spirits, either way seasons have become a complete source of inspiration, where music is just one of the more memorable expressions regarding this matter. From the early baroque of Bach and later baroque from Vivaldi to the multiple romance expressions that found in Mozart, Beethoven, Berlioz and Debussy a place to be this topic has been eloquently described and pictured with elegance and beauty by them all, transcending the barriers of time and entropy and finding a place of admiration in the hearts of contemporary men. With modernity, the expressions and forms may change but the impressions and inspiration remain, bringing new courses of action for artists to express their feelings on the subject of the four seasons, setting new angles for this specific content to be conceived. The CD presents a precious bucolic scene of a house in the prairie, very colourful and vital that is an eye catcher, as usual the presentations from Zhelozobeton are minimalist and simple but incredible effective to call attention. The whole CD lasts for more than an hour leaving time for each track to develop and consolidate its message and effect over the listener. The first half of the work originally recorded in 2001 has been already issued previously on Blade records in 2002 as a limited edition called “Rural”. The two additional tracks, previously unissued find in here a perfect complement to be finally issued. What Aidan Baker and Jim D.Jong (aka The infant cycle) brings in this work issued by the (enthusiastic and specialized in drone) Russian label Zhelozobeton is a modern exemplification on the impressions that the four seasons still imprint over the human soul. Time has passed since the classics and the romantic period, styles have varied a lot, as much as the forms which conforms the construction of the modern music. Aidan Baker & The infant cycle deliver a perspective entirely conceived for electronic devices akin with the character and imaginary of our contemporary epoch. The distorted and unrecognizable guitar spectre from Baker continuously creates endless texturized drones interwoven with a multi organic and mesmeric fluidity, his set is stood out by the uncompromised variant from J.D. Jung that brings feedback generators, samplers, rhythms, a thumb piano, bass and guitar to create a dual construction that exemplifies the course from each season in a very gentle and persuasive progression. The music construction is rather simple, usually starting with one undulating drone that gets richly endorsed by subsequent sets, additional adorns in the form of rhythms and effects and usually transforming in a very soothing guitar jam of alien character. At times the music presents the beautiful transition that you could find in the early works from Pink Floyd or Alan Parsons. Subtle, delicate, psychedelic in its transformation, colourful in its forms and constructions and really touching in its delivery, each track is able to communicate a set of feelings on the listener’s perception, and that is one of its outstanding characteristics. The work really opts for a suggestive approach, enhancing mental images and common perceptions that may find a place for mutual encounter with the listener. The prosaically track called “Summer” its the start of the album, and its vibrant conjunction of buzzing drones and waving oscillations really sets the image of a vast camp crepitating under a radiant sun, while the contours of distant things lose its figures in the hot reverberation, and industrial trait is also present, resounding like a diesel motor in the background of the drone play and multiple panelling oscillation and curious loops apparitions. The evolution of the track is spasmodic, easily transforming the sunny day in an afternoon of pleasant contemplation, the distorted guitar slowly introduces as a floating hum, gradually converting in a softened pink floyd-esque jam accompanied by a foggy blues like percussion and subtle bass lines. The heat finally decreases transforming in a calmed night of peaceful freshness. Very impressive starter track, with a clear accent from the psych rock 60s and smart description of how the summer feels. “Temperature drop” describes the autumn, the drones are now more slow paced, elongated and distant, transporting the listener to a world where the spirit is able to divagate and perceive without obfuscation, echoes from a distorted acidic guitar dirge appears in the distance, somehow resembling the latent life that nature presents and slowly fades away in the undulation of the melancholic repetitiveness from the drones. This track preserves a rhythm that is perceived in the movement from the drones, and their undulant rhythm, still bringing a sense of warmness and vitality. An element that the icy track “You left your breath on my window” lacks off presenting a gelid set of drones that demarks with their high frequency and contrasted low tones the embrace of winter. In here the drones works without the aim for rhythm, sounding radically vaporous and cold with the guitar simply adhering to them in equal terms, fusing in an amalgam of frozen gestures that solidify a sole structure. Spring manifests in “Rights of spring”, rhythm returns and the undulating loops create this sense of movement, sound elements found in summer and winter are present, such as the still gelid and punctuated ether from the background drone juxtaposed with the fixed loop of the first plane, that sounds like an incessant tumult of light and warm pushing the atmospheric envelope, ready to come in and touch earth once again. The guitar plays a cacophonous sortilege, atonal chords and buzzings that reminds the sound of insects and hives, spring brings life and the duo is able to recreate this feeling! Excellent work made by these pair, Baker confirms once again his master condition; the forms he is able to create with his guitar in this work are simply unspeakable, sophisticated, attractive for the ear and eerie at times. The company from The Infant Cycle clearly adds to the collaboration a distinctive quality, an expansion and an aura considered in a series of effects and aural enchants that suits well for the summoning of the four seasons and the particular vision shared by the pair in order to create this final conjunction. Recommended work, a must for all lovers of drone ambient, this is a remarkable vision on nature and its effects over the human soul. Jack The Ripper, Heathen Harvest. [...] The distinct personalities are well visible, the conjunction of the prevalently mechanical character of TIC’s instrumentation with AB’s ever-expanding steamy auras working quite nicely. A sickish cyclicality remains at the basis of an engulfing kind of estrangement which only rarely gets soothed by characteristically celestial cracks caused by the Canadian’s stratified cries (which, for my taste, have always brought superior results when those lysergic fuzzy guitar lines are discarded, leaving the looping mass alone to overwhelm a transfixed listener; Baker is still the man when it comes down to that). An appreciable game of proposal and acceptance of reciprocal suggestions between the artists, translating into a genuine will of sounding a little different than expected. Definitely a good one, yet it takes a while before realizing. Rural Sprawl finds Jim DeJong, who goes under the stage name “The Infant Cycle” teaming up with Aidan Baker, a classically trained musician on an experimental album which is comprised of four, albeit, richly layered tracks. Baker’s instrument of choice is the electric guitar, which he uses on this album to create sounds that range from the drone of an electric wire to the eerie sound of hovering insects. 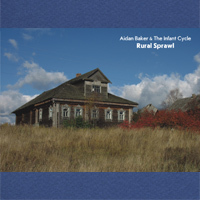 Judging from the cover art, and the even darker austere of the album’s cover, the record seems to expound on the isolation and lapses in time associated with rural landscapes. “Summer” begins with repetitive clicks and beeps amidst a manic whirring sound that continues on throughout the entirety of the track, the clicks and beeps growing louder, and finally subsiding at its conclusion. “Temperature Drop” jettisons onwards with the same tracking beat, like a tape that has finished and needs to be flipped over onto the other side. The duo builds a calm aura around the beat with sliding bell sounds that sound ghostlike and fragile at the same time. The song continues onwards becoming a richer, more complex sound with haunting horns that allows the amalgam of sounds to crescendo near the end of the track, in a distressing array of organ and electric guitar samples. “You Left Your Breath on My Window“ is another expansive effort that begins with sharp crackles which then die down and eventually give way to spurts of electronic beeps and whirrs that blossom in complexity and frequency. Here lies the essence of the concept of Rural Sprawl, a maniacal juxtaposition of silence, and clatters of repetitive sounds that justify the view one could imagine from looking through an isolated house, in the middle of nowhere. “Rights Of Spring” ends the effort with livelier waves of electronic sound that emanate into sharp electronic pulses, which end in sweet sounding electronic influences, similar to that of chirping birds. Overall, Rural Sprawl is an engaging and at times, sophisticated me'lange of electronic that draws from sparse and at often times, eerie influences. The abandoned manor overlooking a moody field, the sounds of birds heralding the first signs of spring, the loss of a loved one whose presence still lingers; all these concepts are captured faithfully on this effort. Furthermore, judging from the length of each track, the duo will soon helm another interpretation that will no doubt, enrich the experimental genre even further. Seasonal music, id est a music that could be fitted to or associated with a particular season, has always been a good deal and that’s quite notorious to a lot of music operators since centuries: Christmas-related marketing specialists launching cds fillep up with Xmas carols, pop stars, official and unofficial religious institutions and even ancient Celtic bards and Hindi gandharvas seems to know that! And there’re some nice attempts even among electronic musicians (think for instance to Martin Jules’ Herbstlaub or as well as well as more famous ones by classical old composers (from Vivaldi to Prokofiev) aware of the fact that each season of the year could arguably have its own sound. This intriguing album well-crafted by the Canadian musicians Aidan Beker and Jim DeJong (aka The Infant Cycle) issue by the juicy industrial and experimental Russian label Zhelezobeton seems to be another attempt of giving voice and grabbing sounds from the intimate spirit of the four seasons eternally cycling in a year (even if nowadays pollution is slightly changing the natural rules…). Rural Sprawl – what an elegiac title! – contains four tracks, one for each season, four states of the soul, which seems to be the acousmatic harvest from a mindful haemorragia derived by the squeezing of perceptive spheres of the musicians by help of a respectable kit including tapes, a bass, some guitars, a feedback generator, a sampler, some playouts and a thumb piano. Four tracks partially reminding works by Strings of Consciousness or Origami Galaktica, mainly designed on powerfully hypnotic overstretched drones enriched with entrancing binaural pulses and nicely sequenced sounds, skewing the audio climax. This sprawl starts with the flat loopline saturated by a guadually eruptive infiltration of an atonal sound sustained by fluttering rhythms and a follicular guitar tune, wholly exudating the memory of those sneaking summer noons and its intimate sense of stunning stillness. My favourite track – and just by chance my favourite season – is the one dedicated to autumn: the sense of suffocating oppression is reduced and a more melodic and melancholic (and sometimes moaning) tone permeates through the drone surrounding the listener till the end, when it turns into a strangled lovely guitar solo… Both Summer and Temperature Drop were recorded in 2001 and already release on a very limited CD-R by the Italian label Blade Records. In order to complete the natural cycle of this album, Aidan and Jim recorded two others in 2005. The first one reflects the lethargic savour of winter throughout a silently murmourous set of subtones, an hardly dragging kit of electronic sounds and pure jems of isolationist drones, gradually preparing the ground for the more organic one of the final track, an enchanting anthem with tiny sounds on majestic sounds waves, summing up the reflowering of natural elements normally marking spring-time in a captivating way. Very good record, highly recommended for brain machine addicts! All Ontario tag-team effort as Toronto's Aidan Baker and his hitherto lesser-known compatriot, The Infant Cycle (aka Jim DeJong of nearby Hamilton), generate and distress industrial-strength drones. Rural Sprawl is the clever monicker chosen for this expanded version of a previous release called "Rural", which consisted of the two first tracks on the present disc. Coming out of the speakers in waves, ”Summer” initiates proceedings with what could be described as a faux-field recording. Imagine the world from a close to the ground perspective, with mechanical crickets and frogs chirping and croaking in the wetlands and dragonflies zooming overhead. It?s summer alright but at dusk. After a while, we are slowly lifted far above the rural landscape below, the quiet, looping beat tantalizingly almost out of earreach. ”Temperature Drop” is dreamy, swirling novas slowly organizing themelves into a repetitive, one-finger melody which Baker's guitar eventually enjoins, soloing solemnly at a distance. Several kind of unnecesary false starts until ”You Left Your Breath on My Window” gets serious as the two assemble an orchestral tidal wave gaining in size and velocity before dissapting surprisingly quickly into mere foam. ”Rights of Spring” is tremblling air over a trainyard of heavier background activity. Nestled in a beautiful cover. An album of great texture.